LASIK surgery is a procedure that corrects nearsightedness (myopia), farsightedness (hyperopia), and astigmatism by permanently changing the shape of the cornea, increasing focusing power and improving vision. In LASIK surgery, precise and controlled removal of corneal tissue by a special laser reshapes the cornea changing its focusing power. LASIK surgery is one of the most common vision correction procedures. It is designed to reduce your dependency on glasses and contact lenses. LASIK surgery is about a 15-20 minute in-office procedure performed at Crews LASIK & Cataract Center. We have been successfully treating patients in Vancouver, Washington; as well as Portland and Central Oregon for over 25 years. LASIK, or Laser-Assisted In-Situ Keratomileusis, is an FDA-approved refractive procedure that is performed on nearly 1 million patients each year. After your eye has been completely numbed using “eye drop” anesthesia, an eyelid holder will be placed between your eyelids to prevent you from blinking. Next, an instrument known as a microkeratome makes a protective flap in the cornea. During this process you may feel a little pressure but no discomfort. You will be asked to look directly at a target light while the laser reshapes the cornea, usually in less than a minute. The Excimer laser removes microscopic layers of corneal tissue to change its shape, allowing light rays to focus more directly on the retina. Then, the protective flap is folded back in place where it bonds securely without the need for stitches. After LASIK, some patients report a slight discomfort that usually goes away within twelve to twenty-four hours. Which Type of Eye Surgery is Best? People all over the world place their confidence in the safety and precision of VISX technology. 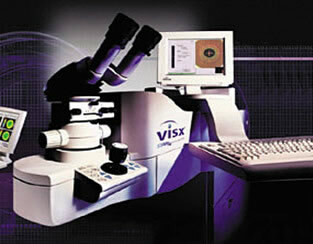 VISX excimer lasers have been used to successfully treat millions of eyes in the U.S. and around the world. This laser features variable spot beam technology and an eye tracking system that actively follows the tiniest motions of your eye in all three dimensions, capturing more than 99.4 percent of eye movement. It tracks your natural pupil and doesn’t require your eye to be dilated like other laser systems, so you can relax during your LASIK treatment knowing the procedure will be delivered accurately. The VISX CustomVue is an individualized laser vision correction procedure that is Wavescan driven. This enables Dr. Crews to measure and correct imperfections that are unique to each individual’s vision that could not have been measured before. Wavescan technology was originally developed for use in high-powered telescopes to reduce an individual’s eye 25 times more precisely than standard methods used for glasses and contact lenses. 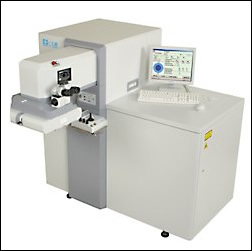 NIDEK EC 5000 excimer laser system for the treatment of LASIK is an FDA approved laser that can treat nearsightedness, farsightedness, and astigmatism. It is equipped with one of the most advanced eye-tracking technologies in the vision correction field. Its 60Hz infrared eye-tracking technology follows and responds to tiny eye movements within 5/1000th of a second. This in turn translates into an incredibly smooth corneal treatment surface and faster patient recovery. NIDEK is approved by the FDA for a wide range of nearsighted, astigmatic, and farsighted LASIK corrections. Its sequential treatment of astigmatism and nearsightedness ensures wide treatment zones, optimizing day and night-time quality of vision. NIDEK’s extra-quite, accurate and rapid treatment minimizes patient anxiety during the treatment, and ensures quickest recovery. The NIDEK EC-5000 Excimer Laser System has been approved for use in the United States to perform LASIK for the correction of myopia, hyperopia and astigmatism. Nidek Corporation is one of the largest eye care companies in the world and makes a variety of ophthalmic equipment. If you are interested in LASIK to reduce your dependence on lenses or eyeglasses, Dr. Crews can determine if you are a LASIK candidate. Myopia, or nearsightedness, occurs when light rays are focused in front of the retina instead of directly on the retina. To treat nearsightedness, the cornea must be made flatter. This is accomplished by removing tissue from the center of the cornea. Regular astigmatism occurs when light rays are focused at more than one point on the retina. 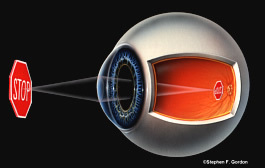 To treat astigmatism, the cornea must be made more spherical. By changing the pattern of the beam, tissue is removed in one direction more than the other. Hyperopia, or farsightedness, occurs when light rays are not bent enough to focus on the retina. To treat farsightedness, the central cornea must be made steeper. This is accomplished by directing the laser beam to remove tissue from around this area. As we get older, we gradually lose the ability to change focus from distance to near. Usually beginning in their 40’s, people experience blurred vision at near points such as when reading, sewing or working on the computer. This condition is called presbyopia and it makes reading and other close work increasingly difficult. As this occurs, people who have been nearsighted or farsighted begin to wear bifocals. People who have never worn glasses begin to wear reading glasses for close-up work. The excimer laser is not used to treat this condition because reshaping the cornea will not affect the aging changes occurring to the lens inside the eye. However, a laser vision correction option called monovision is available. With this type of treatment, the surgeon fully treats one eye for distance, and the other eye for near vision. This laser vision correction treatment leaves one slightly nearsighted eye for good near vision without glasses.